Job Profile All duties attached to Medical Clinic of the Bank as Pharmacist/Compounder, for Pharmacists including assisting in Clerical work, whenever necessary. Should be able to give first aid treatment independently in accident cases. Educational Qualification: Pass in SSC or its equivalent examination and minimum Diploma in Pharmacy from recognized university or Board. Candidates with degree in Pharmacy will be preferred. Experience: The candidate must be a registered Pharmacist under Pharmacist Act with State Pharmacy Council or similar recognized body constituted for the purpose. 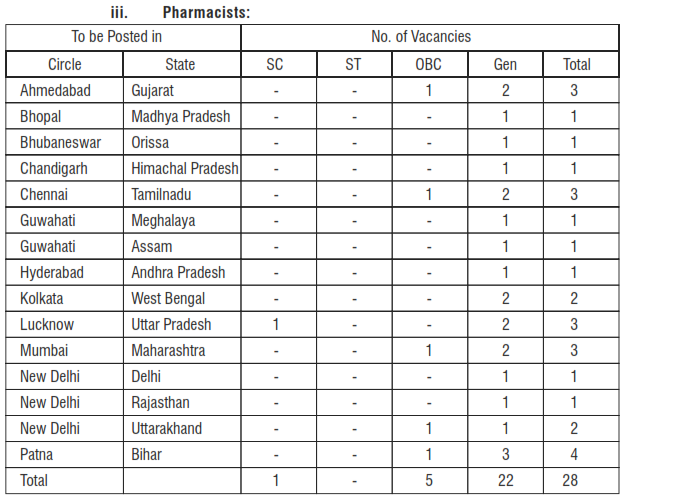 Minimum 1 year experience as Pharmacist or Compounder.